Nationally important landscapes have protection through the law. These special areas have been designated by drawing a carefully chosen line on a map, although the system is different in the various parts of the UK. The first National Parks – designated in 1951 - in the UK were the Peak District and the Lake District. The most recent are Loch Lomond and the Trossachs (2002) and the Cairngorms (2003) in Scotland and the New Forest (2005) and South Downs in England (2010). Northern Ireland is currently considering its first National Park – the Mourne Mountains. The Parks are enjoyed by millions of people and their landscape, wildlife and cultural heritage have the highest level of protection in terms of landscape and scenic beauty. Promote public understanding and enjoyment of their special qualities. In case of an irreconcilable conflict priority is given to the first purpose of conservation. The Broads is designated under its own Act of Parliament (the Broads Act 1988) and there is an additional purpose to protect the interests of navigation (and no rule about conflicts). National Parks can be run by National Park Authorities. These Authorities have a mix of locally and nationally appointed members. In pursuing Park purposes, the Authorities have a duty to seek to foster the socio-economic interest of their local communities (Section 62 of the Environment Act 1995). There are currently 34 Areas of Outstanding Natural Beauty in England and Wales covering about 15% of England and 5% of Wales. AONBs are areas designated for the purpose of conserving and enhancing their natural beauty. This includes landform and geology, plants and animals, landscape features and the rich history of human settlement over the centuries. safeguarding rural industries and the interests of local communities. Under the National Parks and Access to the Countryside Act 1949 and the CROW Act 2000, public bodies (like local authorities and utility companies) are under a special duty to have regard to the purpose of a National Park or AONB. Natural England and Natural Resources Wales may vary a National Park boundary using powers granted under the Wildlife and Countryside Act 1981 and an AONB Designation Order under the Countryside and Rights of Way Act 2000. Any boundary change made through these powers will be set out in a (Boundary) Variation Order. 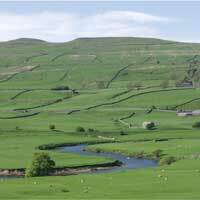 A boundary review is currently going on for an area between the Lake District and Yorkshire Dales National Parks, which, if progressed, would effectively extend the boundary of both Parks.